According to the World Bank, Malpass appointment followed due process as agreed to in 2011, adding that he was subjected to thorough due diligence and a comprehensive interview by the executive directors. Abrupt resignation led to Malpass’ appointment: The position of the President became vacant when Jim Kim abruptly resigned three years ahead of schedule. Kim had been appointed out of three available nominations – Nigeria’s Ngozi Okonjo-Iweala and Colombian, Jose Antonio Ocampo. Malpass will be taking over from Kristalina Georgieva, who was appointed as an interim President after Kim’s resignation. Malpass has been appointed for a five-year term beginning on Tuesday, April 9, 2019. Malpass previously served as Under Secretary of the Treasury for International Affairs for the United States. During his tenure, Malpass represented the United States in international settings that included World Bankand International Monetary Fund, as well as many other global economic conferences, as stated by the World Bank. “AND MEETINGS OF THE FINANCIAL STABILITY BOARD, THE ORGANISATION FOR ECONOMIC COOPERATION AND DEVELOPMENT, AND THE OVERSEAS PRIVATE INVESTMENT CORPORATION. 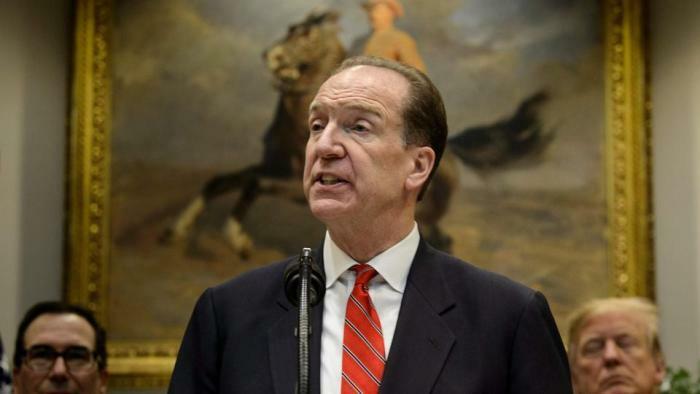 Malpass had long been a staunch critic of the international development bank. During an interview with CNN business reporter, Richard Quest at the World Economic Forum in Davos, Okonjo-Iweala said she’s available if nominated for the position. She, however, said only the right condition will determine her interest. Okonjo-Iweala made her intention known while addressing reports that she’s interested in the position. She was a front runner in the race against a United States’ nominee, Jim Kim. That prompted many to believe Okonjo-Iweala will be considered. But she wasn’t nominated for the position.